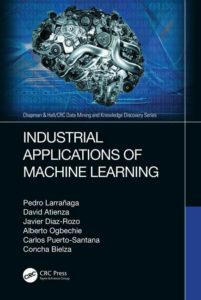 Industrial Applications of Machine Learning shows how machine learning can be applied to address real-world problems in the fourth industrial revolution, and provides the required knowledge and tools to empower readers to build their own solutions based on theory and practice. The book introduces the fourth industrial revolution and its current impact on organizations and society. 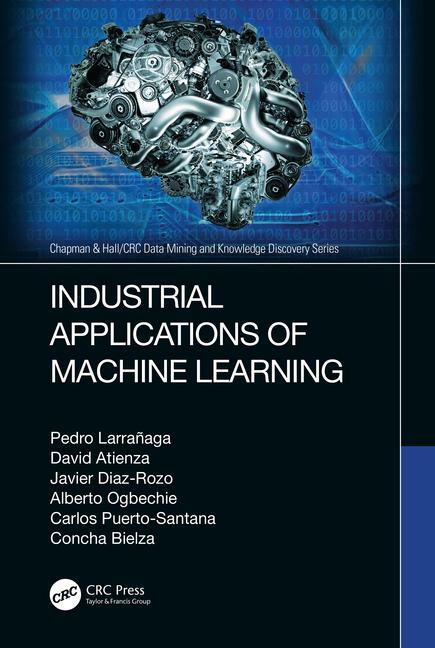 It explores machine learning fundamentals, and includes four case studies that address a real-world problem in the manufacturing or logistics domains, and approaches machine learning solutions from an application-oriented point of view. The book should be of special interest to researchers interested in real-world industrial problems. Pedro Larrañaga is Full Professor in Computer Science and Artificial Intelligence at the Universidad Politécnica de Madrid (UPM) since 2007, where he co-leads the Computational Intelligence Group. He received the MSc degree in mathematics (statistics) from the University of Valladolid and the PhD degree in computer science from the University of the Basque Country (excellence award). Before moving to UPM, his academic career was developed at the University of the Basque Country (UPV-EHU) at several faculty ranks: Assistant Professor (1985-1998), Associate Professor (1998-2004) and Full Professor (2004-2007). He earned the habilitation qualification for Full Professor in 2003. Professor Larrañaga has served as Expert Manager of Computer Technology area at the Deputy Directorate of research projects of the Spanish Ministry of Science and Innovation (2007-2010). He has been a Member of the Advisory Committee 6.2 (Communication, Computing and Electronics Engineering) of the CNEAI (Spanish Ministry of Education) in 2010-2011. His research interests are primarily in the areas of probabilistic graphical models, data science, metaheuristics, and real applications, like biomedicine, bioinformatics, neuroscience, industry 4.0 and sports. He has published more than 150 papers in impact factor journals and has supervised 26 PhD theses. He is fellow of the European Association for Artificial Intelligence since 2012 and of the Academia Europaea since 2018. He has been awarded the 2013 Spanish National Prize in Computer Science and the Spanish Association for Artificial Intelligence prize in 2018. David Atienza received his B.Sc. degree in Computer Science from Universidad de Burgos, Spain, in 2014, and the M.Sc. degree in Artificial Intelligence from Universidad Politécnica de Madrid, Spain, in 2016, where he is is currently a Ph.D. student. Javier Diaz-Rozo received his M.Eng. degree in Mechanical Engineering from Universidad de los Andes, Bogotá, Colombia, in 2001. Additionally, he obtained a M.Sc. degree in Advanced Manufacturing Technology and Systems Management from the University of Manchester, UK, in 2003. Before joining Aingura IIoT as the IIoT Team Leader, he has gathered nearly 15 years of industrial experience working in different positions related to R&D: R&D Project Manager at Ikergune (the Etxe-Tar Group R&D unit) where he was responsible for the advanced manufacturing research area, Senior Consultant in a R&D consulting firm in 2010-2014, R&D Director in a business group mainly dedicated to the wind energy sector in 2008-2010 and Director for the advanced manufacturing area in the ASCAMM Technology Centre in 2006-2008. Currently, he is also a Ph.D. student at UPM. Alberto Ogbechie received his M.Eng. degree in Industrial Engineering from Universidad Pontificia de Comillas, Spain, in 2012. Additionally, he obtained a M.Sc. degree in Artificial Intelligence from Universidad Politécnica de Madrid (UPM) in 2017. He worked for 2 years (2012-2014) at Deloitte Consulting Spain, as Senior Consultant. He is currently working in a private company. Carlos Puerto-Santana received his B.Sc. degree in Mathematics from Universidad de los Andes, Bogotá, Colombia, in 2015. Additionally, he obtained a M.Sc. degree in Artificial Intelligence from Universidad Politécnica de Madrid (UPM) in 2018, where he is is currently a Ph.D. student. He worked for one year (2016-2017) at PM-Tec Engineering (Bogotá, Colombia). Concha Bielza received her M.Sc. degree in Mathematics from Universidad Complutense de Madrid, Spain, in 1989 and her Ph.D. degree in Computer Science from Universidad Politécnica de Madrid (UPM), in 1996 (extraordinary doctorate award). Since 2010 she is a Full Professor of Statistics and Operations Research in the Department of Artificial Intelligence, UPM and coleads the Computational Intelligence Group. Her current research interests include machine learning, probabilistic graphical models (mainly Bayesian networks), decision analysis, metaheuristics for optimization, spatial statistics, and different real applications, like medicine, bioinformatics, neuroscience, industry and sport analytics. She has published more than 100 papers in impact factor journals and has supervised 13 PhD theses. She was awared the 2014 UPM Research Prize. Previous story Releasing Connector/Node.js – What Does it MEAN?